Improves athletic performance. Aids in speedy recovery. Help reduce exercise fatigue. Increases strength and stamina. Enhances endurance levels. L-Citrulline has taken its original name from the Latin Citrullus which means ‘watermelon’. In 1914 it was then isolated and known as a critical factor in the urea cycle. The urea cycle is a biochemical reaction via which human beings can produce urea and ammonia. It can be produced in our intestinal tract by process of reaction between ornithine and carbamyl phosphate. It can also be produced when a conversion process occurs and L- citrulline is broken down into nitric acid along with L-arginine. This combination of citrulline malate is nothing but a mixture of an amino acid with malate which was used in Spain in olden days and was given as an antiasthenic drug. INLIFE is one of the known brands that helps many bodybuilders and people to achieve their sports and nutrition goals. This is a common ingredient that is used as a pre-workout supplement by people who are into bodybuilding. It is one of the BCAAs (Branch chain amino acid). Citrulline malate as a combination helps in reducing muscle soreness and also helps to increase exercise performance and endurance and hence, in turn, works well for reduction of muscle weakness and pain which occurs due to heavy exercises. It is essential when you exercise that you should not get tired quickly, this supplement will help you work out for a longer time without getting bored and fatigue. Citrulline malate helps in increase of nitric oxide, which assists in many ways like, increase hardness in male sexual organ and hence helps in erectile dysfunction. In few studies, when citrulline malate was given to children suffering from mitochondrial disorders, it was found to increase nitric oxide levels in the body. 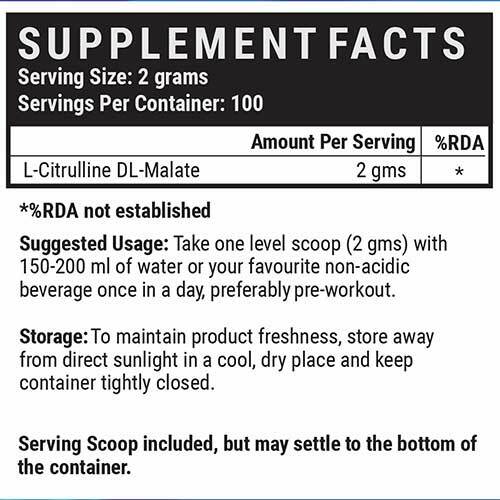 Who Should Choose to take L Citrulline Malate? INLIFE L citrulline malate is an ideal supplement for all the people hitting the gym on a regular basis and are very serious to attain a good physique without any side effects. If you consume INLIFE Citrulline Malate, you will achieve what you want, and the great thing is that you will not have to sacrifice your health for the same. Suggested Dosage – Take 1 level scoop (2gm) with 150-200 ml of water or your favourite non-acidic base beverage once in a day, excellent pre-workout or suggested by your fitness and health expert. Worth taking product, using before workout and feel the difference. Taking along with whey protein for gym and working better for muscle recovery after work out. Very effective product, as I have been doing well and not feeling fatigue anymore.